Your online reputation, especially on social media, can make or break your business. With more and more customers resorting to Twitter and other social media for bad reviews and complaints, how you deal with these comments will define your reputation. 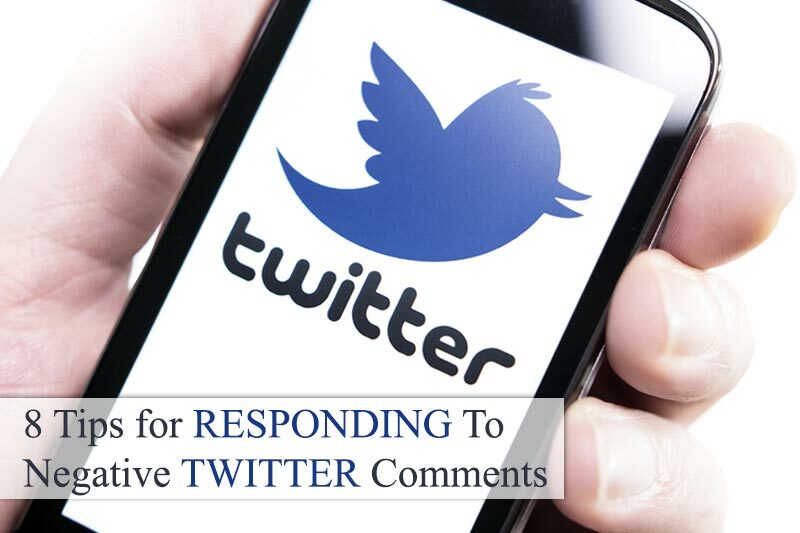 Following are the top eight things that you can do when confronted with negative Twitter comments. Sympathy always stands out great in comparison with anger. A negative comment is lets you know what your viewers think about your post. Even if someone is clearly looking for a chance to start a fight with their negative Twitter comments, do not let it affect you. Besides, think how bad can a 140 character tweet, or less, hurt you personally? Some online tweets or complaints are not even valid; not all though. To know its relevance, you will first have to investigate and know what really happened before taking any actions. Was it a bad experience with the staff or the product had some defect? Understand the situation, find out who was in the wrong and then make your decision. Make sure that you tackle the issues before anyone has made it into a huge chain of conversation by retweets. Everything on Twitter moves real fast. According to a study, 25% of customers await you to get back to them within an hour whereas 6% await within 10 minutes. Some companies have a script to follow in such situations. Beware! Consumers can spot the scripted response, especially if they have seen your past responses with the same words. Try to be be yourself to respond every negative tweet individually. Simply saying ‘sorry for your bad experience’ is not enough. You need to provide them with information which will help them solve their problem. Negative Twitter comments should be publicly addressed on the actual tweets that are sent out. You can invite them to take the conversation on to emails or send them a direct message on Twitter. It is not to start a ‘flame war’ but to solve their problem in a better way. However, don’t ever neglect a public acknowledgment and start with the off-Twitter messaging. If there has been a genuine mistake from your side, be it you or any of your employees, own up to it. But, make sure you learn more about what happened before accepting mistake. A lie that is found spreads way more quickly than an honest mistake being accepted. Owning up helps turn a complaining customer to a happy customer. Work hard to satisfy your customers at all times. Sometimes, you will learn that some customers will never be pleased, no matter what you do. Realize that’s social media platforms receive rapid complaints, and at some point you have to shift your focus from the never-pleased-customers and get back to work. Great post…With more and more customers resorting to Twitter and other social media for bad reviews and complaints, how you deal with these comments will define your reputation. How Important Is Social Media for Business? Question: What Are the Best Link Building Tactics for 2019? Business Marketing Psychology: Is Your Message Relevant? Do You Have a CRM Solution to Help Manage Your Business Relationships?